Sometimes a film has enough fun that you're willing to forgive and forget it's shortcomings. Such is the case with Stewart Sparke and Paul Butler's Book of Monsters, a bloody-grinned monster party that's one part Goosebumps, one part Evil Dead (with bits of Buffy the Vampire Slayer sprinkled in for good measure). Combined with an overarching plot straight out of every 90s high school comedy-drama ever made, you've got yourself a rather packed—if uneven—horror bash at hand. Sophie's 18th birthday becomes a bloodbath when monsters descend upon her house and start to devour the party guests. The teen and her friends must soon rally together to send the party crashers back to hell. Opening with an effectively creepy backstory, we're made to understand both the power of the book (of Monsters) and its traumatic ties to the film's lead, Sophie (Lyndsey Craine). A title cut, some character building and time skip later, we're tossed head first into a maelstrom of malevolence. One by one, demonic creatures are conjured from the other side, and one by one, Sophie's party guests are ripped to shreds. There's also some contention abound, most of which a result of the friction created between high school cliques. Popular girl, popular girl's entourage, conflicted girlfriends, free loading burn outs, and of course, the jock. But all of that is mostly overshadowed by everyone's heads being pulled from their bodies—this being Book of Monsters greatest strength. If a lighter-hearted version of Raimi's cabin horror classic sounds like fun (change the local to a suburban homestead), then you'll likely dig what's on offer here. All manner of beasts, slayers, creatures, monsters, creeps and perverts make an appearance at the party, and all of them get their licks in to some vile degree. Teens are literally torn in half, decapitated, disemboweled, stabbed, hickeyed, oozed on, and generally made to regret their RSVP. Even better, most of the nastiness comes by way of solid practical effects (best represented in a solid display of body horror towards the film's finale), something I didn't expect given the paltry budget. So kudos to Natasha Banks, Samuel Oates, and Mark and Paul Wilkins—great work. 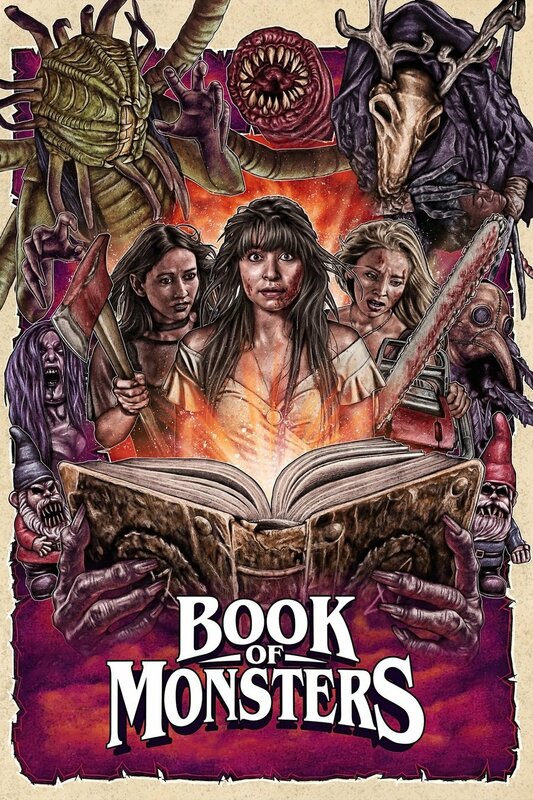 I say, as long as you understand what Book of Monsters actually is (an excuse to indulge in some mindless gory fun) and what it isn't (a competent teen dramedy)...good chance the titular villains won't be the only ones having a good time.